Gone are the days when paintings can be viewed as “pure expression.” The networked lives we lead in the 21st century have given the lie to notions that thought, action or even intention can exist independently in a vacuum of their own self-referentiality. Yet, artists often pursue their profession from a deeply personal place; out of a need for free expression, looking to unleash the unique creativity of their character. This presents an inherent tension between the role of art and artists in society and their need for self-expression. Indeed, artists often feel a duty to contribute value to society, to create work that adheres to a code of ethics and “really matters.” The work of Tymek Borowski is a probing study into the power of art to provide revelatory glimpses into the function of aesthetics: to make visible and problematize intangible concepts like freedom, communication and information. 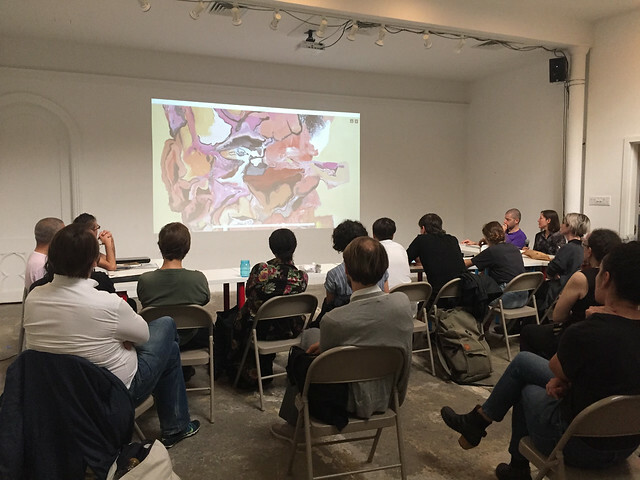 In this interview, Elizabeth Grady and Borowski will explore methods the artist has found to satisfy both expression and the socio-ethical dimension through his work, to investigate the emancipatory potential of expressing personal intellectual freedom through art. In short - how to do the right thing and have fun. Tymek Borowski (born 1984, lives in Warsaw) is a painter, author of videos and digital images. He graduated form painting department of the Academy of Fine Arts in Warsaw (2009). Between 2008 and 2012, he has been a cofounder of several art collectives, galleries and experimental design studio. He has received the VIEWS Deutsche Bank Foundation Audience Award (2013) and “Polityka” Passport Award (2016). Recent exhibitions include: Tschumi Alumni. How art works? How culture works?, Künstlerhaus, Graz (2018); Wild at heart, Zachęta – National Gallery of Art, Warsaw (2018); Tymek Borowski, Polana Institute, Warsaw (2017); Common Affairs, Deutsche Bank KunstHalle, Berlin (2016); Superprojekt, Depot Basel, Basel (2016); Warsaw Under Construction 7: Reconstruction Dispute, MoMA, Warsaw (2015). Elizabeth Grady is Co-Founder and Artistic Director of Clearing, a new biennial summit on art and politics in Eastern and Central Europe. She was inaugural Director of Programs at A Blade of Grass, 2013-18, and is a curator and scholar of socially engaged art. She was Program Manager of smARTpower, a U.S. State Department program that produced participatory art projects in fifteen countries. She has worked at MoMA-NY, the Whitney Museum and SFMoMA, and curated projects for the Moscow, Canary Islands, and Havana Biennials. She has taught art history and museum studies for 20 years, and is a consultant on socially engaged art and organizational structure. Recent publications include Future Imperfect (A Blade of Grass, 2016) and an essay in …circle through New York, the 2018 Guggenheim Social Practice catalog. She holds a Ph.D. from Northwestern University. This program is made possible with the support from the Adam Mickiewicz Institute and the Polana Institute.